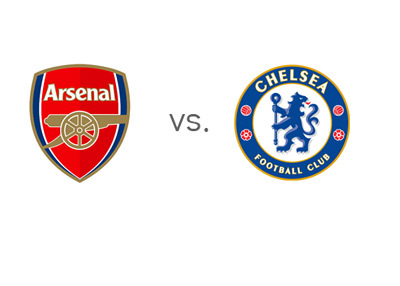 First place Arsenal host third place Chelsea in the seventeenth round of the English Premier League on Monday, December 23rd, 2013 at the Emirates Stadium in London. The kick-off is at 8pm local time. This is a giant match between two title contenders. Arsenal have had a tough month of December so far and could use a victory vs. their city rivals to stay at the top of the Premier League tables. After they were held to a draw in the last minutes of the game by Everton, Arsenal were defeated by Napoli in the Champions League and lost their number one spot in the group. The Gunners were then defeated 6-3 by Manchester City and they drew last year's champions Bayern Munich in the round of 16 of the UCL. Chelsea are two points behind Arsenal in the EPL and have a really nice opportunity to jump to first or second place with a win at the Emirates. After beating Steaua 1-0 in the Champions League to win the group, Chelsea beat Crystal Palace in the EPL and lost to Sunderland in the Capital One Cup. In the Champions League round of 16, the Blues will play against Turkish Galatasaray. Arsenal are the favourites to win. A 100 € bet on Arsene Wenger's side could return 135 € in profit, while the same bet on Jose Mourinho's side could return 230 € in profit. The most likely score on Monday, according to the odds, is a 1-1 draw, offered at 11/2. Olivier Giroud and Samuel Eto are the favourites to score at 15/8 each. This could be a great game.